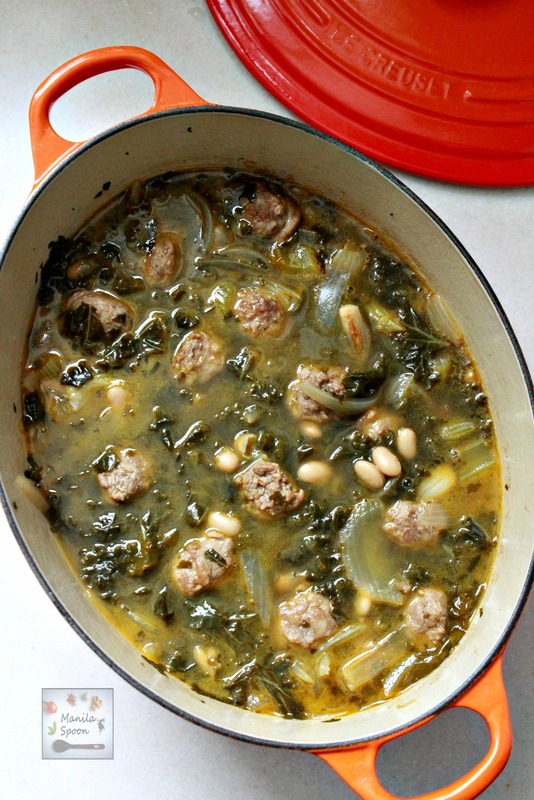 In 30 minutes you have a delicious, nutritious and hearty soup for the whole family – Italian Sausage, Kale and White Bean Soup. Easy recipe, too. Winter season is soup season indeed! Since winter is also the season when you most likely will get sick or catch a bug, I want to make sure that I feed my family healthy and wholesome food, too. As we all know green and leafy vegetables are one of the best sources of nutrients and Kale is certainly often considered the queen (or was it king?) of greens! Naturally, since it’s not exactly candy material and the bright tint of green doesn’t excite my kids either – I need to devise some ways to make them eat this healthy veggie! Thankfully, my kids will eat anything that goes with sausages!! I guess the strong and yummy taste of the sausages perhaps mask anything that they may not like. Whatever. I am just happy if they eat it. 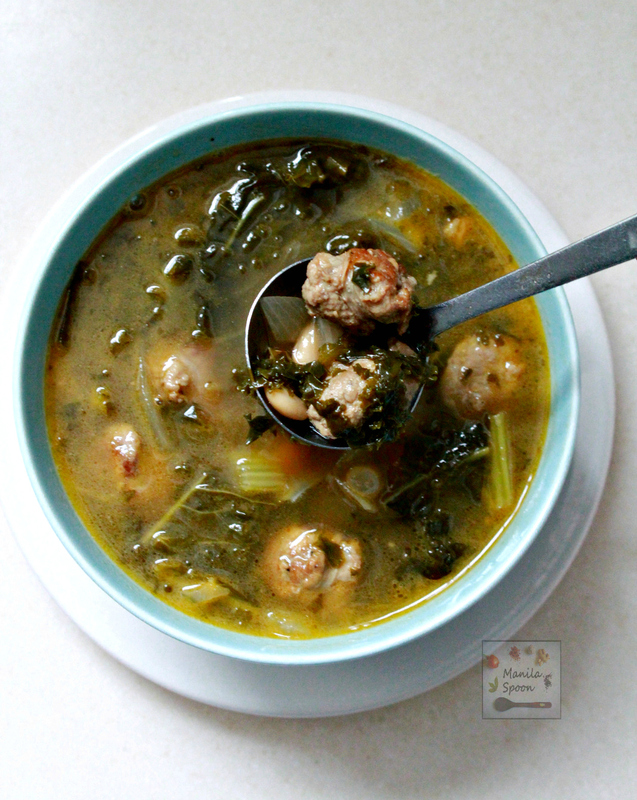 So I finally decided to make my own version of Italian Sausage, Kale and White Bean Soup. I know there are many varieties of this soup online but I am glad that I made one that my family enjoyed. What makes this version slightly different from the other recipes online is — the wine. Well, I had some left-over white wine so why not use it? Wine makes everything tastes better, right? Here, it surely did! I also added some celery just because, a little more extra vegetables for my little ones to eat would be nice, too! But if you don’t like wine and prefer not to use it – that’s perfectly fine. It can always be subbed with extra chicken broth. I just like cooking with wine when available as it truly gives any dish that extra boost in flavor! But, this is your recipe too so feel free to tweak it to your own taste! Enjoy! Heat the oil in a oven-proof casserole pot, like a Dutch oven. Fry the sausages in the oil until nicely browned and cooked through. Transfer to a plate. Set aside. In the remaining oil, saute the garlic and onion for 3-4 minutes or until the onions begin to soften. Add the celery and cook for another couple of minutes. Pour in the white wine and deglaze the pan. Raise the heat a little and reduce the wine to about half. Return the sausages to the pan. Pour in the chicken broth and add the drained beans and chopped fresh kale. Give a quick stir, cover and then simmer on low for 10-15 minutes or until the kale leaves are nicely tender. Season to taste with some salt and pepper. You may add some water if you wish to dilute the soup a little. Serve immediately. Sprinkle some grated parmesan cheese on top, if desired. My family loves to have this with rice but a good crusty bread would pair perfectly, too! Soup is one of the few things that I like about winter. I know my husband would love this soup. Hope you get to try this! Thanks Val! I absolutely adore soups like this. Pinning for later! I will definitely come back to it. I sure hope so and hope you enjoy this! Thanks Vanessa for the pin! I love tossing greens in soup– it makes the soup so flavorful AND gets more veggies in my diet! It's snowing outside right now, so this is perfect! I fully agree with you! Thanks for stopping by Sarah! What a beautiful, healthy meal! I always love eating lots of soups in the winter time. And kale and white beans just seem like the perfect additions to soup. This looks so tasty and comforting! It is comfort food in a bowl for sure! Thanks Stephanie! This soup looks so hearty and delicious. I'm a huge fan of kale, whtie beans and italian sausage so this is right up my alley. Perfect for these chilly winter nights! This is surely a perfect winter-warmer recipe! Please enjoy and thanks Megan! My children will also eat anything with sausages! This soup sounds so delicious and comforting for the cold winter weather we are having at the moment. Hope you can all enjoy this as a family! It is comfort food for winter, indeed! Yum! Kale and white beans are such a great combination. I have been loving making soups lately. It is indeed the season for soups!! Oh I am always looking for new soups to try in the cold weather and this looks wonderful. So nourishing. Hope you get to try this! Thanks Jo! I fully agree, you should just make two so everyone's happy! 🙂 Thanks for stopping by! I make a similar soup and I bet this version is just as delicious. Perfect winter comfort food!! I certainly hope so. Every family has their own favorite, I guess. Thanks Kathryn! Rich soups like this one are a staple for our family in the winter! can't wait ti try this recipe! I'm ALL about soups and stews right now. Hearty soups that can be a main meal are my favorite way to warm up in winter. I love this! We have snow on the ground too so this is certainly a tummy warmer! Thanks Anne! This soup looks fantastic. It sounds perfect for these cold winter days here in Ohio. I'll definitely be trying this one! I lived in Michigan for a decade so I know what life's like over your neck of the woods. This will ease the winter chills for sure! Thanks Tara! 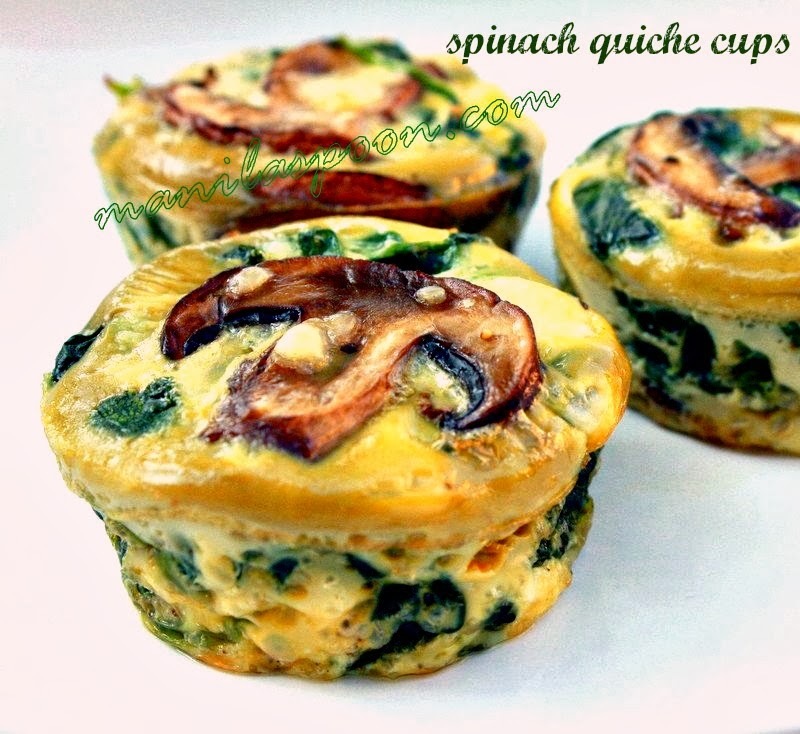 What a great way to sneak in some greens! I'd love to sit down with a bowl of this on a cold winter's day. A mom's got to do what a mom's got to do! LOL. Thanks Sarah! I love boosting my soups with a bit of kale. And sausage just GOES with it. Love this soup! Kale is such an underrated veggie at my house and I really need to start using it a bit more. The soup looks wonderful and is perfect for the cold season. My kids are alright eating any green. I will definitely be trying this to get used to cooking kale. Hope you all like this! Thanks! I love soups like this – so hearty and filling, and no need to make a separate vegetable on the side. This looks perfect to make on the weekend and reheat for a quick weeknight dinner! You can certainly make a big batch! Thanks! This soup was fabulous! I veganized it, using plant based Italian "sausage" that I added a little smoke flavoring to, nutritional yeast (in place of the cheese rind), as well as "Better than Chicken" bouillon cubes, but otherwise, I followed the recipe verbatim and was so very happy with the results. We did let the soup meld for two days prior to eating, and the flavor was rich and well incorporated. We will definitely have this again! This soup was yummy! Although I did tweak it a bit. I used 8 cups chicken broth, 4 cans of white beans, pepper flakes, Italian seasoning, Old Bay, 2 Bay leaves, pepper and I substituted Spinach for Kale. I will definitely make it again! That sounds delicious Patty! Glad you enjoyed it! Thanks!! Seriously just stumbled across this one day and it is my go to winter soup. I actually add some bite sizes steamed butternut squash at the end to contrast all the savory-ness from the sausage and “better than bullion” broth. When I’m feeling sassy I’ll add some chili flakes. Haven’t had the wine on hand so never add it. Must try soup! Thanks for stopping by and letting us know. It is one of my faves too. I made this 2 days ago. IT WAS DELICIOUS!! I had my great granddaughter try it. She was hesitant at first because she says she doesn’t like soup of any kind. Guess what? She asked me if I could make it again today. So if haven’t tried this soup, you’re missing out. And sooo easy to make. Thank you for coming back and letting us know. Glad you enjoyed this!